When unearthing what has been left behind, the urge to reconstruct the lingering fragments of memory manifests itself-- not only to make sense of the story but as well as to blueprint what is remembered. There is something to be said about how certain unexpected reminiscences seem to burn more brightly than others that they lead us to reassess the past. In Land of Promise, pixie-like sisters Gail Vicente (older of the two by four years) and Marija Vicente return to the accounts of their childhood, fleshing out a shared autobiography that encapsulates the struggle between what was perceived then and what is seen through retrospect. Spending their childhood in Davao, the sisters tell with an expected similarity the beginnings of their story. Exhausting the memories of a skewed sense of hope, as well as the trauma of failed expectations in what was supposed to be everything other than another disappointment, the show lays out the heaviness of such undertaking. There is a danger in immersing oneself in something so dense that it may not offer any answers. However, it is in their disparities that the discourse is illuminated, as well as through their own approaches towards their individual and collaborative pieces. The large diptych oil painting of a grass hill found in the Gap Farm is their collaborative piece. Gail’s somber sky and earthy hues to Marija’s kaleidoscopic palette find junction in one sentiment. On top of the hill face are blocked white letters that spell out ‘Land of Promise’, a moniker given to Mindanao that resonates an immensely seductive proposition, almost succeeding in eliminating any suspicion of a pretext. A land of promise signifies the ‘impending guarantee’ for something better—aka there really is no guarantee for something better. But it is not solely their personal disillusionment that moves the exhibition. Going beyond the confessional, the exhibition finds itself revolving around the matter of the unending resource of promises to be made and their fragility. there is no place for sugar coating in a land of promises. 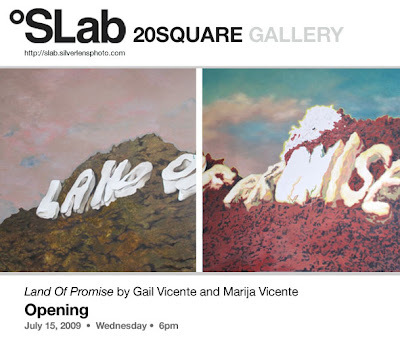 Land Of Promise by Gail Vicente and Marija Vicente will be shown alongside Dead Ends and False Starts by Mariano Ching at SLab and Sundance by Kawayan de Guia, Neal Oshima, Allan Razo and Julius Clar at Silverlens Gallery. For inquiries, contact Silverlens Gallery at 2/F YMC Bldg. II, 2320 Pasong Tamo Ext., Makati, 632.816.0044, +63.905.2650873, or manage@silverlensphoto.com.